There are circles in which the utterance of the words “Muskwa-Kechika”, or any notable landmark in the area, is met with fervent whispers as if one had just mentioned a buried treasure. To those of us fortunate enough to have set foot in this great wilderness, that is exactly what it represents. Nestled in the Northeast corner of British Columbia, the Muskwa-Kechika Management Area has often been called the Serengeti of the North, and aptly so. This ecologically significant region is incredibly rich and varied in its wildlife, and as often follows, in its hunting history. Bordered to the west by the Cassiar Mountains, the north by the daunting waters of the Liard River, and the east by the northern end of the Rocky Mountain chain, the Muskwa-Kechika is hallowed ground to the mountain hunter. If being home to the legendary Chadwick Ram is not enough, a quick glance through the pages of the British Columbia Big Game Records, or Boone & Crockett Club is enough to convince the most ardent of skeptics that this region is worth exploring. The Muskwa-Kechika Management Area (M-KMA) is a 25’000 square mile wilderness area, set aside in 1998 by the British Columbia Government due to its considerable size and lack of roads, as well as its cultural, ecological and geographical diversity. Boasting healthy populations of Stone Sheep, Moose, Caribou, Mountain Goats, Elk, Grizzly & Black Bears, wolves, wolverines, as well as all manner of other insects, birds, fish, and plants, it truly lives up to its moniker. As with every huntable species throughout British Columbia, the game in the M-KMA is managed as thoroughly as possible, with stone’s sheep, caribou, mountain goat and moose (in one management unit) requiring a compulsory inspection from B.C. Fish & Wildlife officials after harvest. At the inception of the M-KMA in ‘98, the BC Ministry of Forests, Lands and Natural Resource Operations estimated the BC stone’s sheep population to be between 12’000-14,000. At that time, approximately 7,000 stone’s sheep inhabited the M-KMA. Current studies show that a little over 8000 stone sheep call the M-KMA home — about 50% of all Stone’s sheep in the world. While the population density is high, hunting sheep in the Northern Rockies is still challenging. In stark contrast to the tundra-like Cassiar Ranges of NW BC, the Muskwa Ranges of the Northern Rockies are heavily timbered, rugged, and steep. Having previously guided in the Yukon’s Pelly Mountains, the density of sheep was certainly a welcome surprise, however, the terrain would pose a greater challenge. In case you thought otherwise, Stone’s Sheep spend time in the timber. I don’t mean they occasionally cruise the trees to get from point-A to point-B, I mean they spend a lot of time in the timber. If you’ve ever wondered why there aren’t any sheep in the alpine, particularly before, during, and after the mountains have sustained a heavy, cold storm… perhaps you aren’t looking low enough. So with that out in the open, it stands to reason that sheep living in heavily timbered areas spend more time in the trees than sheep that live in low density timber areas. But the sheep density is there, and the hunting is superb. It should be noted that certain areas — particularly those bordering the Alaska Highway — see greater hunting pressure than others, however, there is plenty of room to explore and get away from “the crowds”. 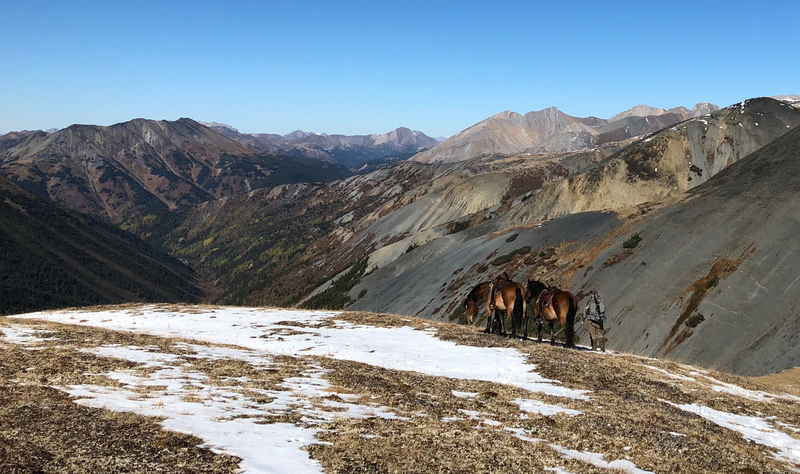 The Muskwa Ranges are also as steep and rugged as they are timbered, which adds a little challenge, but much to the beautiful vistas experienced while hunting. The rugged peaks of the Rockies offer plentiful places for stone sheep to hide, but once spotted, the landscape aids the hunter in concealing themselves on stalks. Perhaps, equal parts a nod to the tradition of the 21+ day ‘expedition’ hunts of bygone eras, and the average age of stone sheep hunters increasing with the cost of hunts, but the vast majority of guided hunts available to non-residents are horseback hunts. British Columbia resident sheep hunters fall on the other end of that spectrum, preferring to hike in from the Alaska Highway or fly in and backpack hunts over horses. In my professional opinion, for those able-bodied, a horse-assisted backpack hunt is the ideal way to chase rams in the mountains. While there is no doubt that horses add a layer of complexity to any hunt, they do make sustained, long-distance travel considerably easier. It’s also pretty damned nice to have a few “luxury” items, such as cheese, bacon & eggs, fresh vegetables, and of course… a celebratory bottle of scotch to uncork. For those residents so inclined to hunt from horses, Steamboat Mountain Outfitters, Double A Packers, and Blue Creek Outfitting all offer reasonably priced horse packing options in the M-KMA region. I cannot speak to any of these operations personally, however, a hunting partner of mine has used Steamboat a few times, and ended up with a taxidermy bill on every occasion. A great option for the hunter with a fist full of tags and willing to capitalize on opportunities, as opposed to holding out for a certain species. Though they have never attained the international status of the Ovis genus, the “beast the colour of winter” will always hold a special place in my heart, and the M-KMA has a healthy population of them. On average, these goats are slightly smaller than their kin that call British Columbia’s North Coast home, both in horn size and body, but don’t let that dissuade you from pursuing them in the Canadian Rockies. If you are after a trophy, Boone and Crockett all-time billies are taken out of these mountains every year, and non-residents can enjoy some savings on hunt cost vs the coastal outfits in British Columbia. The mountain goat season in the M-KMA spans from August 25th – Oct 15th (effective July 1st, 2018 – June 30th, 2020). While the later opening date may cause frustration to an early August sheep hunter with a mature billy in their glass — I’ve been guilty of these sentiments at times — I believe it’s just as well. The off-white hair of a billy, particularly his beard and chaps, is as much of a trophy as the coal-black daggers that sit atop his head. Early August goats have always struck me as looking like domestic sheep, freshly shorn. I mean no offence to anyone who has hunted them in early August elsewhere, or to the billies themselves, but a few weeks goes a long way when it comes to packing on hair length. As with any goat hunting in British Columbia, the terrain is typically rugged and unforgiving. Not so much that you need mountaineering skills & rappelling gear, but rugged enough to give pause to a would-be stalk here and there. Finding a mature billy often isn’t the greatest challenge, though getting to them often can be. I believe the best goat hunting can be had in October, as the colder weather & snow drives them lower into generally more accessible areas. Coupled with a thick, shaggy, white coat to match the snow-capped Rockies around you, and you’ve got yourself an adventure. Likely due to the restrictive access, shorter seasons, and plethora of goats elsewhere in the province, it’s safe to say that the M-KMA isn’t typically the first choice for a lot of residents planning a dedicated mountain goat hunt. That said, it’s wise for any hunter, non-resident or resident, to pack a tag when hunting in goat country. The M-KMA is home to a subset of the Northern Mountain Population of Woodland Caribou (NMP), colloquially known as ‘Mountain Caribou’ by the hunting community. The NMP itself is a collective of thirty-six distinct caribou herds, spread across approximately 308,000 km2, a range that encompasses Northern British Columbia, Northwest Territories, Yukon Territories, and a portion of Eastern Alaska. Four of these herds reside entirely within the confines of the M-KMA boundary, and another three herds have ranges that overlap the outskirts of the M-KMA. Current population estimates of the herds that live within the area put them at approximately 3000 adults, the majority of which are concentrated around the northeast portion of the management area. Often people have the misunderstanding that all caribou exist in vast, far-reaching herds that sprawl like ants across the tundra. While this may be the case in some of the northern herds, the M-KMA caribou herds are much less prolific, both in size and migratory range. Herd populations ranging from as little as 150 up to 1300 adult caribou within the M-KMA, though the term “herd” is used in a much broader sense — you won’t find 150 of them feeding or migrating as a group. Caribou are typically spread out across their range, in small groups. As such, caribou density across the entirety of the M-KMA is usually concentrated in specific pockets. Much has been written about caribou over the years, but rarely does it state that they are the most intelligent animal in the landscape. Anyone that has hunted them knows what I mean. If they aren’t on the move, it’s pretty easy to put a stalk on them. There is a reason that wolves often target caribou over moose where their ranges overlap. When I’m guiding in the M-KMA it’s inevitable that when caribou start showing up en masse closer to the rut, you’ll start to hear wolves at night in the valleys, and see their tracks in the snow on the horse trails. The caribou hunting season in the M-KMA is open — for residents and non-residents — from August 15th through September 30th, with a small unit to the south open for bow-only September 1st through September 30th — both seasons are on a five-point minimum restriction. Some hunters prefer the look of an earlier season velvet antlered caribou, but I believe the best time to hunt them is late in September. In part, because I thoroughly enjoy watching the bulls chase each other around, sparring and locking antlers, but also because the late season typically affords you the chance to look over many bulls. With that said, I believe the true beauty of a later season caribou is in its cape. As the winter snows start accumulating on the rugged peaks of the Rockies, and the rut activity increases by the day, a wonderful change occurs in the caribou. Their manes turn from salt and pepper, greyish cream in the early season to elegant, rich ivory tones of the rut — often reaching down their backs and over their shoulders and flanks. Most of the outfitters in the management area will have some good caribou hunting in spots throughout their tenures. Residents that can find an area the caribou frequent can typically find success, providing they are willing to cover some miles. These caribou don’t have the antler size typically attained by their kin from the NWT, Yukon, or even the Cassiar ranges of British Columbia, however, respectable “representative” bulls can be found, especially closer to the rut. Another advantage to hunting caribou later in the season is the possibility of a ‘combo-hunt’, as the moose and caribou occupy similar ranges, and it’s not uncommon to find mountain goats, or sheep, to be dwelling in the surrounding mountains. I will always be a strong advocate for holding as many tags as you can, as a resident it would be negligent to pass up on an opportunity. Outside of the peak rut, Caribou is fantastic eating. Truly some of the best wild game I’ve had on my plate, Caribou steaks are surpassed only by stone sheep by my account. While I’ve had good result eating caribou up until the end of the season, I have heard conflicting reports so pursue them at your own discretion because when they are bad, they are really, truly, horrible, both in smell and taste. The Western Moose, commonly known as the Canadian Moose, is the second largest subspecies of the Alces family. Slightly smaller in stature and antler size than the Yukon-Alaskan variety, these moose are widespread throughout central and western Canada and found in pockets throughout the northern United States. Populations differ region to region, though they are generally robust, hovering around one million animals across their range. The moose populations of the M-KMA follow this trend, remaining relatively stable over the decades, and seeing a higher degree of hunter success than caribou, stone’s sheep, or mountain goat. This is in part due to the strong moose population, their distribution across virtually all landscapes in the area, and the relative ease of spotting these large ungulates — especially during the rut. Moose in the M-KMA have two general open seasons, the earlier of the two running from August 23rd – 31st is an “any bull” season, with no antler point restrictions. The latter season, September 1st – October 31st, falls under a tri-palm or 10-point antler restriction, which helps maintain both trophy quality, and a reduced harvest of younger bulls. While these bulls typically don’t attain the same trophy quality as the larger Yukon-Alaskan subspecies, their remote location, and close proximity to the Yukon border does lend itself to some exceptional heads being taken every year. A quick look through the British Columbia Big Game Records will attest to this, as bulls with antlers over 60” and well into the Boone & Crockett all time are scattered throughout. By late September the onset of winter has arrived, the willows have turned from a lush blanket of green across the valleys, through their range of vibrant orange, yellow, and red, to a muted brown as the fall to the ground. The accumulating snowline begins to drop, the lakes and beaver ponds freezing over, and the ritualistic dance of the rutting moose begins. If you can’t tell, moose are one of my favourite animals to hunt, and the rut is a magical time for those who pursue them. Hunting lakes and valleys bottoms via boat is a popular method taken up by residents and non-residents alike, though to my mind hunting them on horseback is the purest way to experience a moose hunt. I won’t speak to backpacking for these giant ungulates, as I have never had the great discomfort of doing so, and do not intend to. Largely mirroring the trends in moose population and hunter harvest, Elk in the M-KMA enjoy a healthy population, having increased substantially over the years. Prescribed burns and a focus on predator management in the past has aided in this, and as a result, the hunting can be superb. There are a number of different seasons throughout the M-KMA which vary by management unit. Units with the greatest ease of access and hunting pressure seeing the shortest seasons, and stricter antler point restrictions. Much like the visuals of bull moose feeding knee deep in a mountain lake, the piercing, guttural bugle of a bull elk cutting through the frosty mountain air at dawn is as iconic a symbol of the wild Rocky Mountains as the jagged peaks themselves. Similar to the caribou of the M-KMA, the elk populations can be found in specifics pockets and valleys, and are not present throughout the area. Poplar forests, and burned ridges along valleys are popular habitats, and they can typically be found in concentrated numbers in the areas they exist in. Outfitters see good success in the elk hunts, mostly conducted from remote horse camps, away from the pressure of resident hunters. Arguably one of the more popular hunts amongst residents, hunters see a great deal of success backpacking and riverboating for elk during September. It wouldn’t be a stretch of the truth to say that many a sheep hunt has been derailed in the M-KMA over the years by a bugling bull in the valley below. As I have mentioned with other species in this area, it’s wise to pack a tag during the season, regardless of what your objective quarry may be. Bulls in the mid 300” trophy class are attainable and on occasion those numbers ranger into the higher 300’s. As of December 2017, the British Columbia grizzly bear hunt is cancelled indefinitely. This came not due to a decline in the population, but rather from societal pressures on a new, and left-leaning government. Much has been documented about it both here and in other publications, though it’s noteworthy to mention that this decision was not based on science or any kind of scientific data. The Auditor General of British Columbia has, in fact, stated that hunting was the least threat to the grizzly bear population of British Columbia. Regardless of the politics surrounding the grizzly hunt, the M-KMA is one of the finest grizzly habitats in the province. Incredibly remote and lacking human presence for much of the year, it offers a robust and varied diet for these great bears. Fish, berries, and of course wild game keep the grizzly satiated throughout the season, as such they are found in abundance throughout the management area. Rarely a day goes by that I don’t find fresh grizzly sign on horse and game trails, or spot them feeding lazily on berries in the alpine. Often there is an irrational fear that is built around the grizzly, largely bolstered by parties that haven’t spent very much time in their vicinity. They are the apex predator of the North and should be treated with a great deal of respect. While I am certainly not a naturalist, by my observations of the grizzly their predisposition is neither benevolence nor malice, they are simply high-functioning opportunists. Understanding the habits and traits of the grizzly, and using a heaping dose of common-sense and critical thinking is the best deterrent to bear encounters in the M-KMA, and any other place they exist. While it is rather unlikely that you will have a life-threatening encounter with these bears, it can happen, and you will likely have run-ins. It is worth noting that in areas of higher hunting traffic or grizzly density, hunter kills are a common food source for bears. Should you chose to pursue large ungulates in this region, and cannot get the meat boned and packed out on the same day, expect to find a grizzly on the carcass when you return — and be pleasantly surprised when they aren’t. Marking your kill site with flagging tape, and approaching the carcass from upwind while making some noise is a great start, so long as you pack the flagging tape out of the bush with you afterward. Whether hunting them in the past or encountering them in the present, I find the grizzly to be one of the most captivating animals to observe in their natural environment. They are truly the kings of the mountains and can be found from the lowest valleys to the highest peaks. I had the pleasure this past fall of watching one scour the cliffs of a 7’000 foot chain of mountains, digging relentlessly for marmots while I hunted for moose in the willow flats below.